Kids Haus loves Romp’s Pouch Pals, and so do we! What a sweet way to keep toys organized and off the floor! Kids are more likely to help with clean-up too, when tossing toys into the animal’s pouch. Lilsugar suggests a darling, affordable, handmade end of year gift for teachers: the Yellow Tea Bus. Cruise on over there to see how to make one! Always on the lookout for anything ‘owlie,’ Babyccino gives us something else to hoot about: mixed media collage artist, Linda Solovic’s Friends of a Feather Flock Together print. Made from found objects, these nine cute, colorful owls will keep watch over baby during the night. 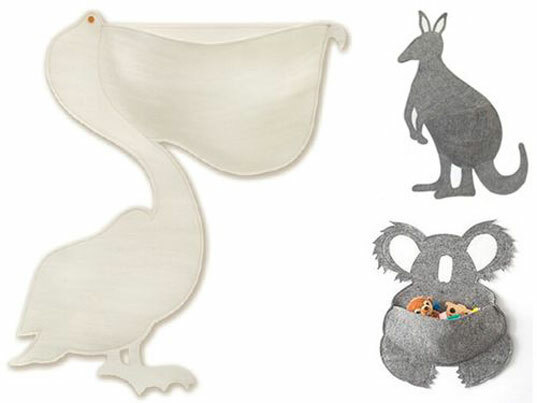 Handmade Charlotte discovers Clive+Sunshine heirloom animals by artist Jennifer Muskopf. These gorgeous, handmade animals are crafted out of vintage materials and are a ‘must-have’ companion for tots who love wildlife. Droolicious shares our affinity for Offi’s space saving designs, as they highlight Offi’s Nester Boxes. They say they’re like the ‘Russian nesting dolls’ of storage, and the ideal solution for storage for tots and adults alike. Kids Haus loves Romp's Pouch Pals, and so do we! What a sweet way to keep toys organized and off the floor! Kids are more likely to help with clean-up too, when tossing toys into the animal's pouch.